Jo's Favorite Things: February 9: Pizza, Bagels, and the Beatles! February 9: Pizza, Bagels, and the Beatles! It's snowing in the Midwest and that snow is supposed to be heading East. We may get 10 or more inches in Chicago. If you live in the Midwest or the Northeast, you may get a snow day.. or you may be able to work at home or leave early. That would be a nice way to celebrate February 9th! And Happy Birthday Carole King! 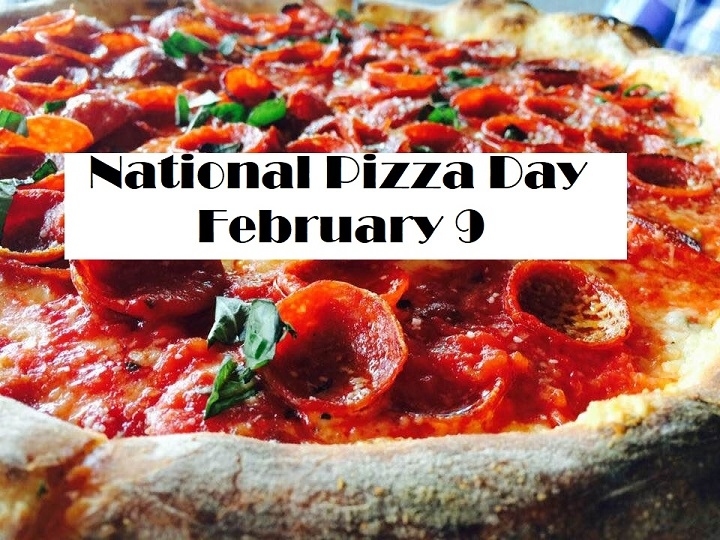 If it is too snowy, you can celebrate National Pizza Day (see below) by popping a pizza in the oven, or, better yet, getting a pizza delivered, that is, if the roads are clear enough to let the pizza delivery guy get through. Many places are having special deals for National Pizza Day; Google your city and the words "National Pizza Day" and see what you get. William Henry Harrison, the 9th President of the United States, who caught a nasty cold at his inauguration March 4, 1841, and died of pneumonia a month later. Carole King, prolific songwriter, was born in 1942 in Manhattan. She is "the most successful female songwriter of the latter half of the 20th century in the USA, having written or co-written 118 pop hits on the Billboard Hot 100 between 1955 and 1999." Economist and Nobel prize winner Joseph Stiglitz (born in 1943). Novelist Alice Walker of "The Color Purple" fame was born in 1944. Mia Farrow, of Rosemary's Baby fame, wife of Frank Sinatra, long-time girlfriend of Woody Allen, and mother of many, was born in 1945. Other February 9th birthday babies are listed HERE. Your birthstone is the beautiful lavender amethyst . (Ancient Greeks believed that the stone protected the wearer from drunkenness and enabled them to keep a balanced mindset.) You were born under the sign of Aquarius. (I can't help hearing that song "The Age of Aquarius" whenever I write that.) I hope you are having a Happy Birthday! How many hours of daylight now? We have 10 hours, 22 minutes, and 6 seconds of daylight today, so we've added back 1 hours 15 minutes of daylight since the Winter Solstice on December 21st. Check out the exact time until Daylight Savings returns HERE! Sunday, March 11, 2018, meaning we have 30 more early evenings until sunset in Chicago, today at 5:16 p.m., jumps to 6:52 p.m. We will then have about 1 hour and 14 minutes more daylight in total than we have now -- and 2 hours and 35 minutes more daylight than we had on the Winter Solstice on December 21, 2017. Oslo, Norway? Detroit, Michigan? Denver, Colorado? Oslo is much farther north than Chicago. Whereas Chicago has 10 hours and 22 minutes of sunlight today, Oslo only has 8 hours and 41 minutes of sun today. The sun won't rise until 8:10 a.m. Oslo time, and it will set by 4:52 p.m. Their days are getting longer, but they still have very dark long nights. Detroit, just a bit north of Chicago, has 10 hours and 20 minutes of daylight, only about 2 fewer daylight minutes than Chicago. The sun rises at 7:36 a.m. Detroit time, though, almost an hour later than it rises in Chicago, so the sun doesn't set on Detroit until 5:56 p.m., about 45 minutes later than it sets in Chicago. Denver, Colorado, is a bit south of Chicago. Denver has 10 hours and 30 minutes of daylight, about 8 more minutes of daylight than Chicago has. You can search for your city HERE at the sunset/sunrise lookup of the TimeAndDate site. Queen Elizabeth's sister Princess Margaret died in 2002. She was 72. Bill Haley, vocalist (Rock Around Clock), dies of heart attack at 55 in 1981. Gaus, an orangutan who lived to be 59 died in 1977. Max Yasgur, owner Woodstock-festival farmland, died in 9173 at age 53. Fyodor Dostoyevsky, Russian novelist (Crime and Punishment, The Dream of a Ridiculous Man) who helped shape literary modernism and existentialism, died from a pulmonary hemorrhage at 59 in 1881. What happened on February 9th? 1267 Synod of Breslau orders Jews of Silesia to wear special caps. 1825 House of Representatives elects John Quincy Adams 6th US president. No candidate received a majority of the Electoral College, so the Congress decided the winner. Adams took his oath of office on a book of Constitutional Law instead of the Bible. 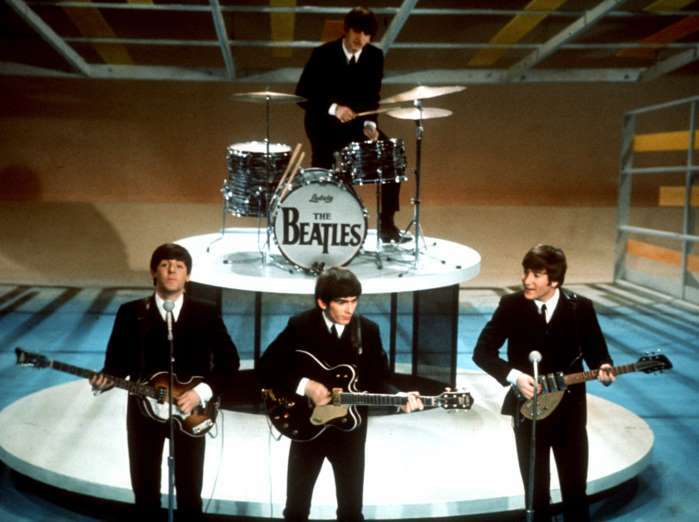 1964 (54 years ago)-- THE BEATLES' FIRST LIVE PERFORMANCE: The Beatles make their first live American television appearance on "The Ed Sullivan Show," broadcast from New York by CBS. On This Day history events. Anything besides pizza and the Beatles? The National Day Calendar lists many interesting and/or weird "celebrations" for each day. For February 9th, try National Pizza Day, National Bagel Day, National Toothache Day, and National No One Eats Alone Day. Personally, I'll take the pizza and the bagels. I don't want to celebrate toothaches. But I do like the idea of "no one eats alone", so ... invite someone to eat with you (either at home or out) who lives by themselves! Check out this link for interesting facts about pizza, bagels, toothaches, and "National No One Eats Alone". Now you have an excuse to order a pizza for dinner tonight! And find some old Beatles clips to watch on You Tube: Either that treasured 1st performance on Ed Sullivan or the movie A Hard Day's Night.